Indispensable and up-to-date! The ultimate reference tool for writers, Jenkins's guide lists more than 180 book publishers; 170 periodicals by category with rates of pay; hundreds of literary agents; information on contests, conferences, and workshops; editorial services; niche markets; self-publishing services; and more. Essential for anybody looking to break into Christian publishing. 512 pages, softcover from Nelson. 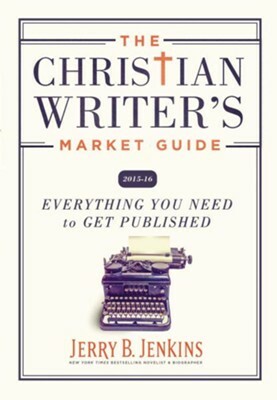 For more than 25 years, The Christian Writers Market Guide has been the most comprehensive and highly recommended resource available for Christian writers, agents, editors, publishers, publicists, and writing teachers. Wherever an author is at on the spectrum of writingfrom beginner to seasoned professionalthis book will help them find what they are looking for. This is the must-have tool for getting noticed and published and the ultimate reference tool for the aspiring Christian writer. Jerry B. Jenkins is the author of more than 180 books, including the 63,000,000-selling Left Behind series. His non-fiction books include many as-told-to autobiographies, including those of Hank Aaron, Bill Gaither, Orel Hershiser, Luis Palau, Walter Payton, Meadowlark Lemon, Nolan Ryan, and Mike Singletary. Jenkins also assisted Dr. Billy Graham with his memoirs, Just As I Am. He also owns the Jerry Jenkins Writers Guild, which aims to train tomorrows professional Christian writers. I'm the author/artist and I want to review The Christian Writer's Market Guide 2015-2016: Everything You Need to Get Published.